b) TDS will be deducted @ maximum marginal rate (i.e. 34.608%) if a member fails to submit PAN (and no Form No 15G or 15H). • Transfer of PF from one account to another PF account. • Termination of service due to ill health of member, discontinuation/contraction of business by employer, completion of project or other cause beyond the control of the member. • If employee withdraws PF after a period of five years of continuous service, including service with former employer. • If PF payment is less than Rs. 30,000/- but the member has rendered service of less than 5 years. 1. TDS is deductible at the time of payment. 2. 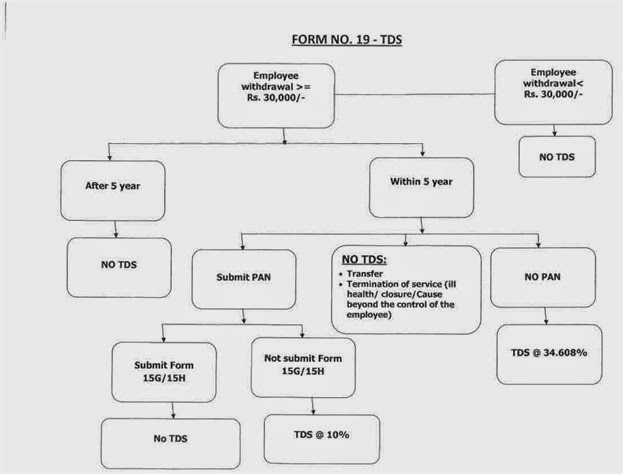 TDS will be deducted under Section 192A of Income Tax Act, 1961. 3. Form 15H is for senior citizens (60 years & above) and Form 15G is for individuals having no taxable income. Form 15G & 15H are self declarations and may be accepted as such in duplicate. 4. Members must quote PAN in Form No.- 15G / 15H and in Form No. 19. Union Budget, 2015 was presented by the Hon'ble Finance Minister Mr. Arun Jaitley on February 28, 2015. On April 30, 2015, the Lok Sabha passed the Finance Bill, 2015 with certain amendments. After being passed by the lower house of Parliament, the Rajya Sabha on Thursday, May 7, 2015 has passed the Finance Bill, 2015 already passed by the Lok Sabha, thus completing the budgetary exercise for the fiscal year.